00:42:00 Makes 6 servings, 1/6 recipe (207 g) each. Makes 6 servings, 1/6 recipe (207 g) each. Melt 1 Tbsp. butter in large skillet on medium heat. Add seafood and lemon juice; cook 3 min. or until shrimp turn pink and scallops are opaque, stirring frequently. Remove from skillet with slotted spoon; cover to keep warm. Add remaining butter to skillet; cook until melted. Stir in vegetables; cook and stir 3 min. Add Miracle Whip and flour; stir until well blended. Gradually stir in milk. Add Cheez Whiz; cook and stir 3 to 5 min. or until sauce is hot and bubbly. Stir in seafood. Spoon into 6 coquille shells; place in shallow pan. Sprinkle with cheese. Bake 10 to 12 min. or until heated through. Sprinkle with parsley. Prepare recipe as directed except do not bake. Cool, then freeze in airtight container up to 3 months. Thaw in refrigerator overnight. When ready to serve, bake in 350ºF oven 15 to 20 min. or until hot and bubbly. 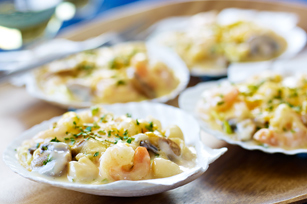 Substitute au gratin dishes or custard cups for the coquille shells. Serving Size Makes 6 servings, 1/6 recipe (207 g) each.